Replacement: None. 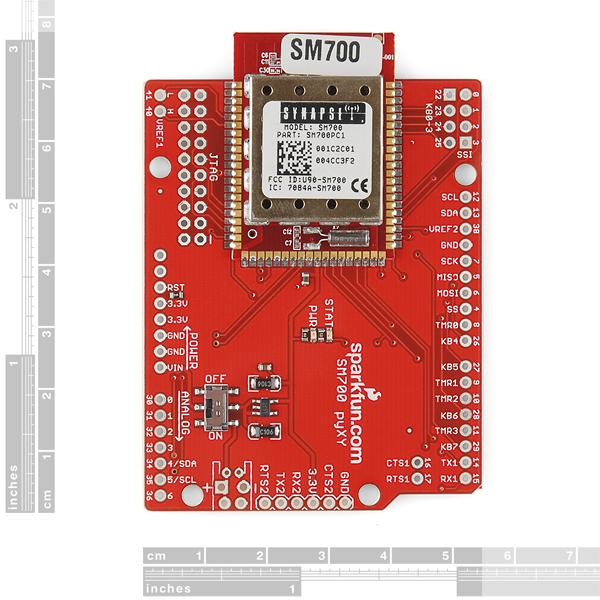 We are no longer carrying this SM700 dev board in our catalog. This page is for reference only. It may look like a regular ol' Arduino shield, but don't be fooled, the pyXY (pronounced 'pixie') is a full blown shield-compatible development board. 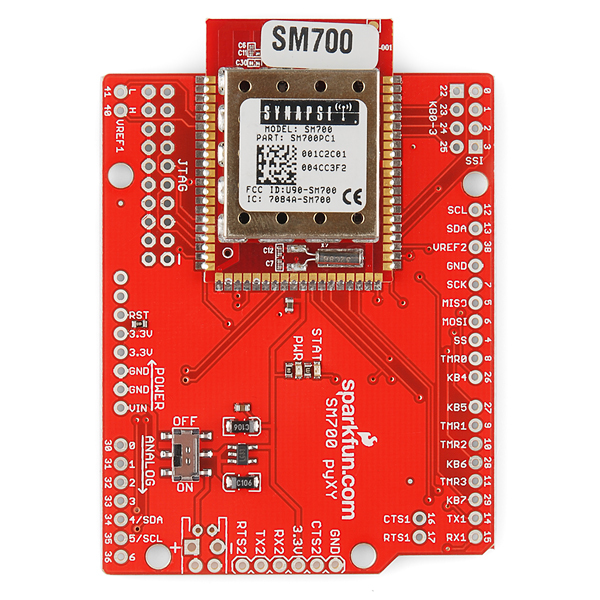 The heart of the pyXY is the Synapse SM700 wireless network module, a mesh network powerhouse that packs a 32-bit ARM7 processor with plenty of on-board memory. What's more, the SM700 can be programmed in SNAPpy, a Python derivative that makes building interactive networks a snap. The shield-compatible form factor and pin assignment make this the perfect platform to develop a wireless sensor device, but if you want to add it to your existing Arduino-powered application, no worries. The pyXY has jumpers to swap the TX and RX lines, effectively taking it from development board to Arduino shield. Don't underestimate the processing power of the SM700, though. With 96k RAM, 46 GPIO pins including 8 12-bit ADCs, and the SNAP OS, the pyXY is a capable board all on it's own. 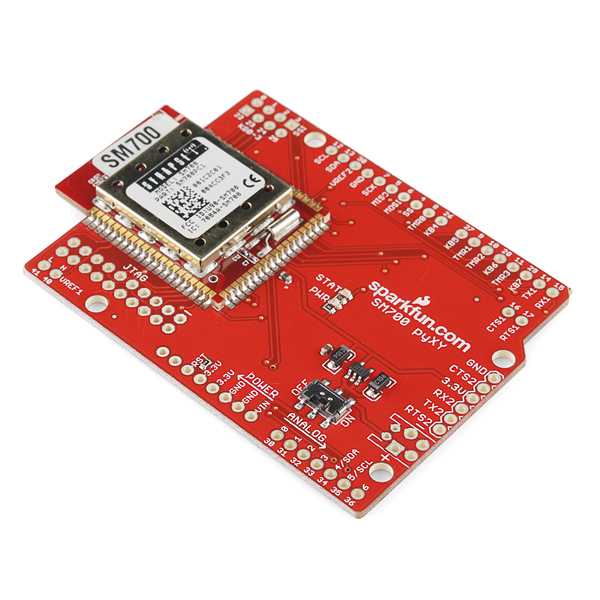 Simply connect the board to your computer using a 3.3V FTDI Basic Breakout and download the Synapse Portal software and you're ready to write and deploy some SNAPpy script. If you have more than one module, you can even program them over-the-air! The Portal software also allows you to tether your Synapse network to full-featured Python scripts on your computer, giving your mesh access to an entire world of libraries and resources. Not sure where to start with SNAP? Check out the Quickstart Guide below! Over-the-Air Programmable with Another Synapse Module! We noticed our "fresh from Sparkfun" pyXY had some sort of test SNAPpy script loaded in it. Over-the-air performance was intermittent, so we used the Erase Script and Factory Default functions on it and all was well. "Erase Script+reboot" (without the Factory Default) might have been sufficient, we just went ahead and did both functions while we were clearing it out. When we bring unit number 2 up we will revisit that. Sparkfun - does your "manufacturing test script" leave txPwr() cut? Or does it have some "busy loops" in it? Hi, are u going to sell only Synapse SM700 module not in a shiled? Multiple vendors sell the SM700 by itself. However since the SM700 is a surface mount part, you will have to make your own PCB. If you goto the Synapse Wireless RF Engine page, there is a place that says "See Pricing". Click on the module Part number and it will display the distributors for that part. does this have enough speed to use this camera (http://www.sparkfun.com/products/8739) in real-time? So why would you want to attach an Arduino to this with so much processing power already available? Exactly! This thing's not meant to be a shield. It's a fully functional microcontroller with a 802.15.4 transceiver, and the SNAP operating system. I laid it out in the Arduino form factor to give it access to the Arduino shields. Plus, a standard breakout board wouldn't have been much smaller, or breadboard-compatible. If someone really, really wanted to use it with an Arduino - as a shield - there are a few jumpers to swap TX and RX; then the two devices could exchange data on the UART. Because so many people know how to use an Arduino and don't want to take the time to learn a different microcontroller. It is not uncommon to have an Arduino shield much smarter than its host Arduino. Excellent point ddegn. Also, I'd like to add that even if you are comfortable with learning and using a different microcontroller, adding an Arduino to manage a certain subset of tasks in a device might be better (e.g. handling an graphical LCD display and simple user input, freeing the pyXY for more time sensitive processing) than doing everything on the pyXY. In that case, the Arduino would function as a daughter-board or sheild for the pyXY. Edit: Also because SNAPpy isn't full-scale Python (see the Quickstart Guide link), this board can't handle floating numbers or integer values larger than 16 bits. There are mulitple possible work-arounds for those limitations, especially if you have a PC in the communication loop. However, in some cases adding an Arduino to the mix might be the easiest or quickest way to process values SNAPpy cannot. Hey guys, any ETA on a a new batch? Considering any updates? I assume you can scan the ADC's and send the values over the air. Also will it talk to an Xbee ? Sparkfun, the range on the SM700 is quite dreadful. Are there any options to increase the distance for this module? Maybe try what tnstaafl triesd a couple of posts above and see it that helps? I haven't tried it (I don't have one), but it seems to have worked for him. OR on-the-fly just call setTMR(2) from Portal (or another SNAP node). So, it looks like Future Electronics is all out of the SM700, and there appears to be no other distributors. Are you hoarding them over there, SparkFun? Mac Portal software won't run. I guess that's why they're calling it a beta "update soon". (Jul11-2012). Dang, I was kinda interested in this platform, but I don't do windows. Anybody run the linux version? So when working with data that SNAPpy does not support, it can be easily sent to the station connected to the PC and the data be utilized there and then sent back? Can you also use the SNAPpy as if by itself but have an Arduino attached to do the math or to store the data on an SD card or something? A very old post. But essentially I used to make my own boards for RF100/RF200/RF300's that had "add-on" headers. Then one of the addon boards I made had an atmega32u4 on it. The atmega32u4 handled the more advanced math and logging to uSD card. Ok so the SM700 is initially mounted on a board and you mounted it on an arduino board... where can i get the Raw SM700 without the Arduino crap. You're just looking for the SM700 module itself? We're not currently reselling it here, but you should be able to get it from one of Synapse's distributors. I keep seeing the memory referred to as "96k RAM". This seems to imply, that even after a SNAPpy script it uploaded, it is not saved in persistant FLASH storage. If so, what the heck is all of the FLASH memory being used for? The ARM7 can run code from ROM and RAM, the flash is serial (but inside the package) and is copied to RAM at boot. I'm sure the SNAP OS give you the option to store the script in flash so it is persistent. Iâm sure the SNAP OS give you the option to store the script in flash so it is persistent. It's stored in the FLASH automatically (no option needed). 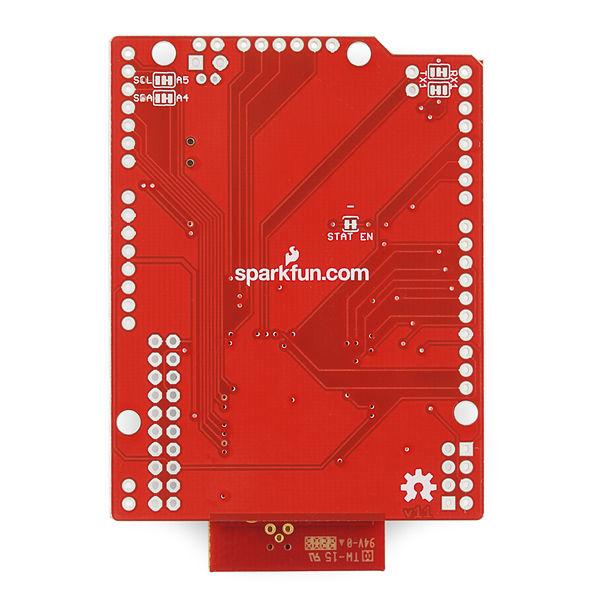 I'd like to thank Sparkfun for offering another option into the Synapse RF line of modules. This looks like a great complement to the other Synapse product you offer and appears to provide greater communication range than the other. I'm getting interested in trying these. Oh I see now. I just don't use shields that much. The large shield form factor seems a little much for what it's worth. But overall this device seems great. I'll probably buy one or modify the eagle file.